Life on the range can get rough and that rough land can turn even the sweetest young man into a gun slinging tough guy. When you're son traveled out west he went with the idea of working as a ranch hand on the wide open prairie. Turns out, other young men had that idea too. The empty towns he heard so much about were bustling with all sorts of people due to the new train running through town. A wet behind the ears kid like himself had no chance of finding honest work. Then he fell in with some bad eggs who showed him the dark ways of the west. It wasn't long until they were holding up trains and raking in the dough. Of course, a buckaroo like himself needs the right gear to keep himself from getting in serious trouble with the law. Make sure he stays in the clear and off of those wanted posters by sending him this gunslinger costume in a care package, you could also send him a letter asking him to come home but once those kiddos get a taste for adventure they can't seem to forget it. 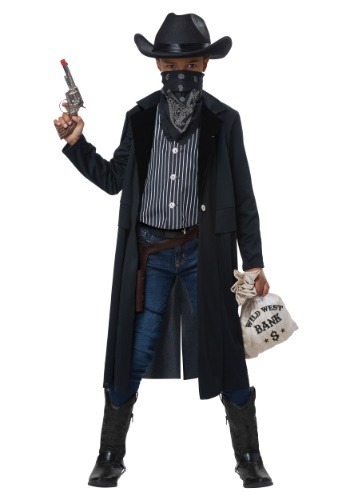 Your little rebel will be ready to star in a classic Wild West film when he dons his gunslinger garb. He may not be billed as a good guy, but anyone who's watched those movies knows that there's always more than one side to the story. Who knows where all that stolen gold is going? Whether he's dressing up for Halloween or a cowboy themed event, this costume is sure to be a train stopper.